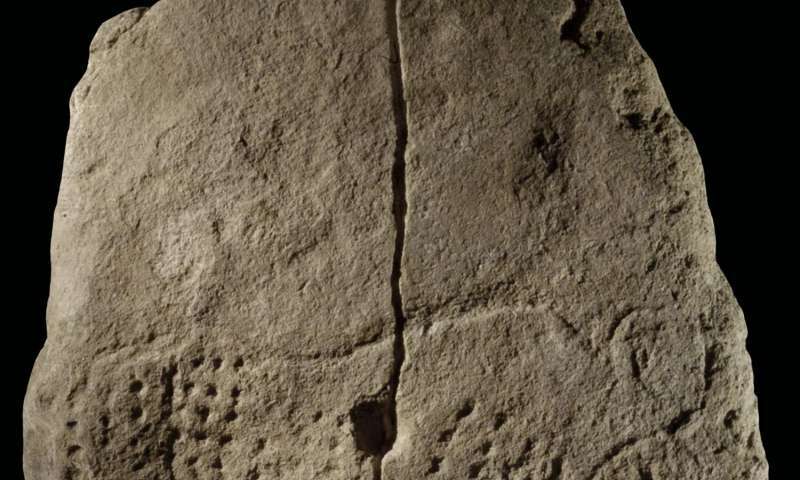 An international team of anthropologists has uncovered a 38,000-year-old engraved image in a southwestern French rockshelter—a finding that marks some of the earliest known graphic imagery found in Western Eurasia and offers insights into the nature of modern humans during this period. "The discovery sheds new light on regional patterning of art and ornamentation across Europe at a time when the first modern humans to enter Europe dispersed westward and northward across the continent," explains NYU anthropologist Randall White, who led the excavation in France's Vézère Valley. The findings, which appear in the journal Quaternary International, center on the early modern humans' Aurignacian culture, which existed from approximately 43,000 to 33,000 years ago. "Following their arrival from Africa, groups of modern humans settled into western and Central Europe, showing a broad commonality in graphic expression against which more regionalized characteristics stand out," he explains. "This pattern fits well with social geography models that see art and personal ornamentation as markers of social identity at regional, group, and individual levels." Abri Blanchard and its sister site, Abri Castanet, previously excavated by White's team, have long been recognized as being among the oldest sites in Eurasia bearing artifacts of human symbolism. Over time, hundreds of personal ornaments have been discovered, including pierced animal teeth, pierced shells, ivory and soapstone beads, engravings, and paintings on limestone slabs. How modern were European Neandertals? There appear to be scratched or etched lines forming a figure in the area above and to the left of the aurochs. Are they intentional or just natural weathering marks? This is pretty cool, just from looking at it for the last 5 or ten minutes I have pretty much decided my first impressions are the way i feel about this. I could be wrong of course but I get the feeling this was not intentional art, I mean, It's art now for sure but it looks to me like it may have been a teaching tool or possibly a Plan and this was used to describe the Plan. Also how to divide the animals Cuts between the groups involved in the hunt. This Large hole being where the main Kill spear would need to be to drop the thing. Long ways to go really but i just like the Idea really well. very cool find.